We are online 24/7, that means that we cannot possibly be in all the wonderful Game Parks and Reserves that we talk about every day. We are looking for contributions from you. Please join to become an “ARMY of Safari Guides and Game Scouts” that we are simply calling SCOUTS. The guys that can report on up-to-date experience and travel conditions. The travelers just getting back online as they arrive home with stories, excitement and fresh reviews of the locations they visited. The Lodges and Hotels or the game guides and drivers that track, spot, know and love the animals they follow every day. The keen photographers that have wonderful pictures of birds and animals that they wish to share. The movie makers that post YouTube videos of exciting animal action, sharing their content. The Community Heads and Conservation champions that want to share messages with stakeholders. WE ALL WANT TO SHARE OUR PASSION FOR AFRICAN SAFARIS WITH THE REST OF THE WORLD! But here’s the fun part! There is no obligation! 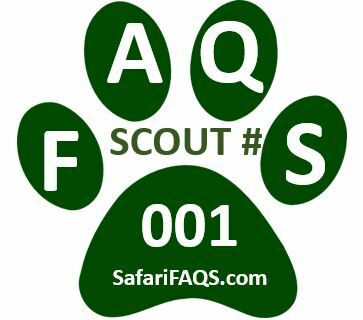 As a SCOUT you will be among the first to hear see an learn about updates, photos, videos and tips. You are a valuable member of the “Army” of Scouts whether you post pictures, comment on the blogs, or update the contributions, or whether you simply like to see great wildlife pictures and read engaging stories. We encourage you to share and like what you find here and pass it along to your friends, connections and potential clients. We encourage responsible content, so all we are looking for is your name and email address. We do not share this information, but need to know you are a real person! Please see our link to Blogging Rules, Content, and Blogging Guidelines here. Please fill out the nearby form and SIGN UP TODAY as our newest Scout and receive your own numbered badge like this to identify yourself and wear with pride!